Amazon and Netflix are changing the TV landscape | What Hi-Fi? 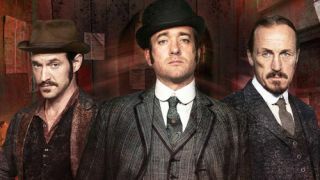 The news that Amazon is to commission a third series of Ripper Street after it was axed by the BBC last year has delighted fans – including me. It has also put paid to the question of whether or not, as an Amazon Prime customer, I need access to yet another video-on-demand streaming service (I already subscribe to Netflix and Virgin TiVo). In case you missed our earlier news story, Amazon Prime Instant Video has launched today in the UK, combining Amazon Prime one-day delivery with LoveFilm unlimited TV and movie streaming. Existing Prime customers will get the new service as part of their current £49/year package until it's due for renewal, when the price jumps to £79. The fact that Amazon, like Netflix, is now commissioning its own programmes has undoubtedly changed my TV viewing habits. I'm completely hooked on Season 2 of House of Cards with Kevin Spacey (I watched two episodes back-to-back last night, then had to force myself to go to bed and not watch a third). Guess what I'll be doing tonight. And don't get me started on Breaking Bad. That was a major addiction, and worth my Netflix subscription all on its own. The fact that there's a third series of Ripper Street coming on Amazon will undoubtedly have me streaming it on Prime Instant Video (even if it does appear months later on the BBC, which has bought the terrestrial broadcast rights). And did I mention that I also have Apple TV? Madness, I know. It's rare these days that I watch anything 'live' on broadcast TV, unless it's a major sporting event or breaking news story. I refuse, point blank, to waste time watching ads in the middle of a programme. Most evenings I check what's recorded on my TiVo box, and if there's nothing on that I want to watch I'll hunt through the various streaming services instead. Of course, I appreciate the fact that I live in an area where it's possible to get 60Mbps broadband, which makes video streaming seamless, and there are still many parts of the country where high-speed broadband is not available. But the traditional broadcasters now face stiff competition. As we've previously reported Amazon Studios invites TV and film-makers to submit pilots, and Alpha House, starring John Goodman (Argo), Clark Goodman (Homeland) and Matt Malloy (Six Feet Under), is set to be the first complete Amazon Studios series to be shown. Lovefilm Instant (the precursor to Amazon's Prime Instant Video) offered streaming TV and films in up to 1080p, Full HD quality, as does Netflix, and Netflix has announced it will stream some programmes such as House of Cards in 4K. So not only are the video streaming services developing their own original content, they're pushing the technical boundaries as well. The point is I no longer care which 'channel' the programme I want to watch is on, I'll hunt it down wherever I can find it. I recently bought a new smart TV, and it cleverly combines content from all the different video-on-demand channels in one single interface, so I can pick whatever I want rather than having to hunt through individual apps. There's only one problem: I don't subscribe to Sky, so don't have access to Sky Atlantic. Which means I can only watch Mad Men and Boardwalk Empire on Blu-ray. Ah well, it looks as if I'll need those silver discs for a bit longer after all.